While our personal lives may offer plenty of opportunities to give thanks, it’s also important to make a habit of it in our professional lives, according to an article in the Cobb Business Journal. 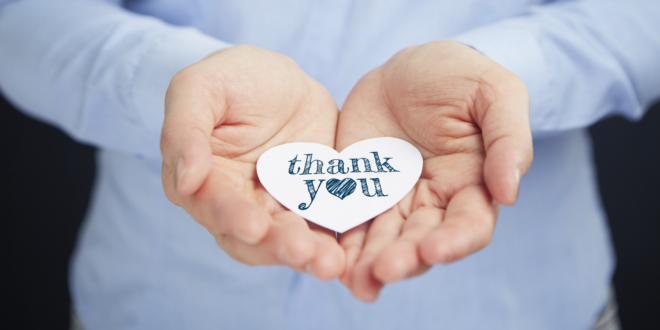 Few people in a study cited expressed gratitude for their work, and that might be because a culture of gratitude needs to be cultivated in the office, and from the top. Business leaders worried that giving thanks will be seen as hinting at a promotion, showing weakness, or failing to inspire hard work should take note of leaders like Richard Branson and Oprah Winfrey. Both view gratitude as an essential element of success and built empires by cultivating a culture of thankfulness. The data support that mindset, with the vast majority of employees reporting they’d work harder for a more grateful boss.